Songoftheyear.com songwriting news - Marilyn Oakley receives song writing honor. 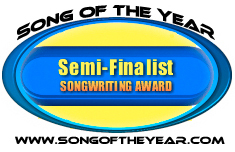 The Song of the Year songwriting contest has awarded Marilyn Oakley the Semi-Finalist placement in the song contest. Song of the Year receives entries from all over the world and only the top songwriters receive a Semi-Finalist placement in the songwriting competition.